We are just 22 miles north of Boise. Turn north on Hwy 55 at State Street in Eagle. Race 4 miles north of Horseshoe Bend. We accept (VISA/MC/DISC/AMEXP) and CASH! Life is good and it is time to RACE to the Ponderosa! - CHECK THE HOURS! Spring is in the air! The days are getting longer! The views are spectacular! 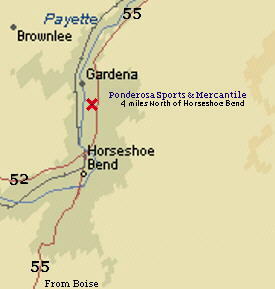 Take a drive: Boise - Horseshoe Bend - Ponderosa Sports - Banks - Garden Valley - Stanley and back! Slow down. There is game everywhere. The elk and deer are crossing the road right in front of you! The river is PERFECT! Be careful. Don't do anything dumb. BOISE COUNTY CAN'T AFFORD THE RESCUES! Leaving Boise on highway 55 from Eagle to McCall, you will have a scenic drive through Shadow Valley and over Horseshoe Bend Summit. The road is always well maintained. From the summit north, views of the Payette River and Boise National Forest are panoramic. A loop along the Payette River provides vantage viewing of world class kayaking and white water rafting. Seasonal wildlife viewers report Golden & Bald Eagles, black bear, wolf, elk, moose, mule deer & whitetail, river otter, raccoon, beaver, bob cat, fox, coyote, turkey, chucker, pheasant and quail. Dining stops should include the river viewing deck at the Riverside Restaurant as you cross the bridge coming into Horseshoe Bend on the south side. The Country Store & Restaurant is on the north side of Horseshoe bend . At Banks, 11 miles north of Ponderosa Sports, the Banks Cafe offers a river viewing deck or inside dining. To gain local flavor, dinner and drinks at the Long Horn Saloon in Crouch will entertain you. Ask about the hole in the forehead of the wooden Indian! If you are a real man, you will put another one there! Ask for suggestions for hikes, drives or serious hunting locations. We have the "Idaho Atlas" and will mark your trips needs. Are you moving to the area, stop in for local advise. Here are some of the local interests via Google aerial photos - "PONDEROSA'S PATH". Be sure to notice "IDAHO'S LIBERAL BURIAL PIT".